While the late Chairman is still seen as a controversial figure for the mistakes he made in his political campaigns, his hometown Shaoshan, a small city in Central China's Hunan Province, was packed with his worshippers despite intermittent rain before and during the anniversary. congregated at the city square, local police in Shaoshan told the Global Times. According to the city's Party committee publicity department, some 40,000 people arrived in Shaoshan on Sunday evening. Deng Fei, a visitor from Wuhan, capital of Central China's Hubei Province, told the Global Times that he comes here every year, but he was not happy with the security check outside the square intended to prevent terrorist attacks. In Beijng, thousands of people visited the Chairman Mao Memorial Hall in Tiananmen Square on Sunday and Monday to get a glimpse of the late Chairman, whose body is kept inside the facility. Visitor numbers on the two days were 10 times higher than on normal days, the manger of the hall told the Global Times. In recent years, a number of leftist organizations in China including one called Hong Ge Hui (Red Song Association) have called on the government to commemorate Mao's birth anniversary more prominently by making it a national festival and giving it a name like "Dong Sheng Jie" (Eastern Holy Festival), "People's Festival" or "Mao-mas" (derived from Christmas). 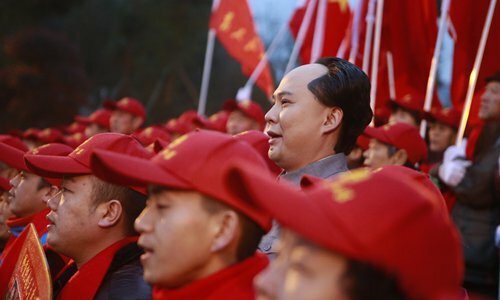 However, Su Wei, a professor at the Party School of the CPC Chongqing Municipal Committee, told the Global Times, "This idea is not realistic because at the Second Session of the Seventh Conference of the CPC in 1949, Mao himself stated that the CPC leaders' birthdays should not be celebrated by the people. So if the government makes December 26 a national holiday, it will be against the norms Mao established for the whole Party since 1949." Su said Mao's greatest legacy in modern China is the socialist political, cultural and economic system that he built, with Deng Xiaoping just fixing Mao's mistakes without changing the foundation of the entire system. "Without Mao's exploration and trial and error during the Cultural Revolution (1966-76), Deng Xiaoping would not know which road was correct," Su said.